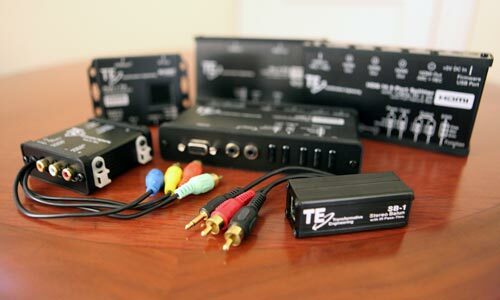 Transformative Engineering (T-E) manufactures and sells the audio, video and data communications devices that are essential elements in the construction of high-end residential and commercial entertainment systems. While these devices may not be as glamorous as the big brand-name video displays and exotic AV processors, they are in many ways more essential to the overall performance and quality of the installed system. As Transformative Engineering enters its second year, the company is already delivering two market-leading products that have been well received by custom installers and systems integrators. In addition, several distributors have also purchased these products for relabeling under their own brand names. Transformative Engineering’s line includes one of the first applications of the increasingly popular HDBase-T standard, which facilitates the cost-effective distribution of a variety of video, audio, and multimedia data formats across large residential and commercial structures. When Transformative Engineering’s founders first evaluated many of the common-use audio-video-data interface devices used in residential and commercial entertainment systems, they immediately recognized an opportunity. Many of these devices offered mediocre quality and performance, and did not address practical needs of custom installers and systems integrators. T-E’s founders saw a need for a range of new products with improved device integration and performance. The solutions they envisioned would be based on the use of new technologies, top-quality parts, superior build quality, and recognition of how these products are used in the field. In addition to Trieber, the other two founders of Transformative Engineering are Peter Tribeman, Vice President of Marketing, and Engne Tang, Chief Technology Officer. Each brings a different perspective and skill-set to T-E while remaining as full-time presidents of their other companies. In addition being the president of Transformative Engineering, Jay Trieber is also the President and CEO of Home Theater Concepts, a ‘Tier-one’ systems integration company specializing in residential and commercial custom electronic installations, and one of the largest such firms in New England. He is also President and CTO of The Service Bench, Inc., a major repair service provider for high-end electronics in the consumer and commercial fields. Peter Tribeman, serving as Vice President of Marketing for T-E, is also President of Atlantic Technology, President of Outlaw Audio; and also an Audio Board Member of the Consumer Electronics Association. Over the years, Tribeman has founded or led many of the famous brands in the industry, including Proton and NAD (USA) Electronics, in addition to Atlantic Technology, and Outlaw. In the early 80’s Tribeman assembled a team, including Dolby Laboratories and LucasFilm, to demonstrate the world’s first home theater employing surround sound. Engne Tang, T-E’s Chief Technology Officer, is also the President of VAC-com, Inc., a prime OEM producer of components and finished products since 1993. Many brands within the electronics industry source product from his associated factories. “Tang”, is also the co-founder of Sherbourn Technologies. His vast experience in electronic design and the ability to source the best components bring the most cost effective method of manufacture to this new company as well. We welcome feedback from our dealers and are committed to excellence in our products.